Corey Volence and Andy Matchett in Key of E. Photo by Emily Gilbert. BOTTOM LINE: An apocalyptic rock musical that may be a little clunky, but still has some solid charm to offer. Evan and Christie Miga, the crafters behind what could be described as a satanic sasquatch, are the real stars of Key of E, an “apocalyptic rock musical” presented by the Orlando-based company Dark Side of Saturn at this year’s Frigid Festival. About halfway through the show, the creature -- a hulking, black monster with glowing red eyes, draping fur, and long, spidery fingers -- emerges through the Kraine Theater’s rotating back wall, driving home the mastery of craftwork that has been hinted at with earlier effects. 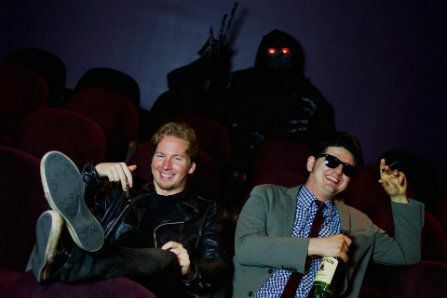 The story Key of E tells is of Ethan (Corey Volence, who also wrote the script), a drunken rocker obsessed with anything dark and doomy and, while he finds his audience singing about the end of the world at a local bar, this nihilistic attitude is clearly hurting his relationship with his girlfriend. When a massive wave of water washes him away to an island of garbage, his dream of witnessing the apocalypse seems to have actually come true, but it’s not quite as awesome as he thought it would be. He encounters a chorus of mostly irksome characters, including the optimistic and humanistic pair named Frankie (Amanda Warren) and Chester (Chaz Krivan), the prototypical douchebag Bryce (John Bateman), and his girlfriend Josie, who echoes the one thing Ethan misses about the world he’s left behind, his girlfriend Joslyn (both are played by Marisa Quijano). Ethan’s plight, which forces him to face his own dark side (namely, alcoholism) is charming enough and interspersed with some musical numbers in which the cast truly gives it their all. There is, however, a sort of meta/psychological plot twist, delivered by the Narrator (composer/lyricist/director Andy Matchett), that isn’t so much confusing as it is confounding: instead of saying “whoa,” I found myself asking “why?” This is part a distracting pattern -- one of many clunky reveals that jerk, rather than propel, the plot to its conclusion. Key of E won a record-breaking eleven audience choice awards at its hometown Orlando International Fringe Festival. With its strange logic and bumpy plotting, this rock musical just can’t stand out that boldly at a New York festival, but this crew deserves some recognition for its no-holds approach. Some truly heartened performances and those crafty effects (which are undoubtedly on the level with the best low-budget in New York), makes for an entertaining, if perplexing, hour of festival theatre.